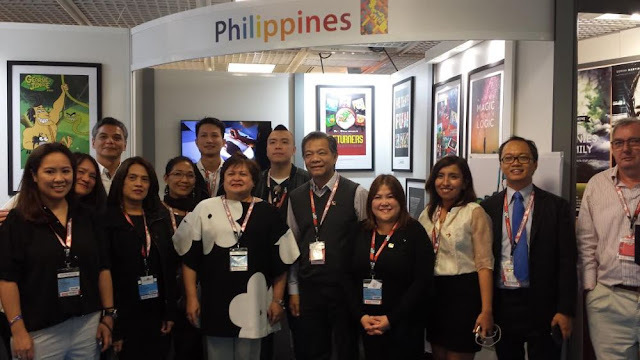 15 October 2016, Cannes, France – A delegation of Philippine animation studios headed by Animation Council of the Philippines, Inc. (ACPI) President Juan Miguel Del Rosario, including ASI Animation Studios, RenderBee, Synergy88, TeamApp, Toon City, Toon City Academy, Top Peg Animation, and 88storey Films just arrived in Cannes, France to showcase their products and services to France and to the rest of the world at the Marché International des Programmes de Communication (MIPCOM). With support from the Department of Information and Communications Technology (DICT), the Department of Trade and Industry (DTI), the Department of Foreign Affairs (DFA), and the Embassy of France in the Philippines, the delegation was able to secure a booth at the MIPCOM. This is the first time that the Philippine animation industry will participate at the MIPCOM under the Philippine banner. Slated on October 17 to 20 in the French entertainment capital of Cannes, MIPCOM is the world’s largest entertainment content market across all platforms. Every year, the industry’s major players such as Disney, Warner Bros., 21st Century Fox and HBO, among others, converge in Cannes for four days of meetings, screenings and conferences. With almost 14,000 participants, over 2,000 exhibiting companies and 4,700 buyers spread over 24,000 square meters of exhibition space at the Palais des Festivals et des Congrès at Cannes, MIPCOM is easily the most anticipated global market for entertainment. Team Philippines hopes to capitalize on these four days to establish key contacts in the global entertainment ecosystem and to sign up new deals and partnerships. “We are very excited about the country’s first ever participation in MIPCOM after how many years. We want to show the world that the Philippines is definitely a rising tiger in the animation industry,” said del Rosario. PHL Ambassador to France, H.E. Ma. Theresa Lazaro, who will be visiting the Philippine pavilion at MIPCOM, added that “France has the largest animation industry in Europe and the third largest in the world, so there is a lot of potential for our animation industry to set up partnerships and increase awareness of the creative Filipino talent in France”. The animation industry in the Philippines started in the 1980s, making it one of the stronger Asian players in the global animation industry today. From only a handful of animation studios then, there are now over 100 animation studios all over the country with a total revenue of US$153 million and over 11,000 full-time employees. Aside from participating in MIPCOM, the Philippine animation delegation will also have meetings with the French Association of Animated Film (AFCA) and the Network of French Animation Schools (RECA), which includes Les Gobelins, the number one animation school in the world, to invite French animators to join Animahenasyon, the country’s animated film festival and to establish possible partnerships in higher education and training.